The southern section of the city, which would serve by the coastal road after implementation, has economically vital role. This zone is one of the prominent industrial cores of the Chittagong city as well as of the country. This zone has great impact on the economy of the country. So the efficient functioning of this zone is very much urgent for the smooth economic growth of the country. And the smooth functioning of the industries of this zone greatly depends on many facilities. Among them, transportation infrastructure is imperative. So, the importance of the road from the perspective of these industries has been illustrated below. There are two EPZ in Chittagong city, where the Karnaphuli EPZ (KEPZ) is the extension of the Chittagong Export Processing Zone (CEPZ). The Bangladesh Export Processing Zones Authority (BEPZA) is the official organ of the government to promote, attract and facilitate foreign investment in the Export Processing Zones. The primary objective of an EPZ is to provide special areas where potential investors would find a congenial investment climate, and location free from cumbersome procedures. Businesses from 32 countries have so far invested in the existing zones (BEPZA, 2011). The export industry’s largest production centers are the EPZs. The Chittagong EPZ plays a particularly important role, accounting for approximately 10% of the total amount of exports (Bhattacharya, 1998). In the competition out of 700 Economic Zones globally 200 participated in the competition. All the zones were evaluated on a 10 point scale on the basis of some set criteria. Among the top 10 of the two categories Chittagong Export Processing Zone, Bangladesh scored 3rd position in the “Best Cost Effectiveness” and also 4th position in the “Best Economic Potential” for 2010-2011(BEPZA, 2011). Table : No. of industries, Investment, Export and Employment of the EPZs of Bangladesh. From the above table, it is clear that CEPZ has the greatest impact on the EPZs of the country, because the maximum number of the industries is situated in the CEPZ, largest investment is in CEPZ and largest portion of export and employment of the EPZs of Bangladesh are by CEPZ. The Chittagong EPZ covers 183 hectares divided into 445 plots. It houses 126 companies, which employ approximately 96,000 local residents. The zone serves as an enormous source of job opportunities in Chittagong. Exports from the zone are increasing steadily, with average annual growth rate over the past four years standing at a solid 11.8% (BEPZA, 2011). The Karnaphuli EPZ is expected to cover 90 hectares divided into 277 plots. The target is to attract 60 companies providing employment to 50,000 people. The Karnaphuli EPZ is to be built at the site of an abandoned steel mill located next to the Chittagong EPZ. It is essentially an extension of the Chittagong EPZ, designed to accommodate companies wishing to enter the Chittagong EPZ but cannot do so due to lack of space. Other facilities are also expected to be operated jointly. Once the Karnaphuli EPZ’s Phase II section commences operation, the two EPZ’s together are projected to employ 150,000 persons, creating tremendous job opportunities in the region as well as expanding production activity (BEPZA, 2011). Access to the Chittagong and Karnaphuli EPZs will continue to be provided solely by the M.A. Aziz Road, which is already severely congested. It will be difficult to ensure smooth transport to and from the EPZs, causing a negative impact on the production activities of the EPZs. Chittagong Port handles about 92% of the country’s import–export trade. As such its importance to the national economy is paramount. In the fiscal year (FY) 2009/10, Chittagong Port handled about 30.5 million tons of cargo and about 1.21 million 20-foot equivalent container units. The annual growth rate for 20-foot equivalent container units handled has been 9.4% in the FY 2009/10. Inefficient port operations and inadequate intermodal connectivity are principal issues in Bangladesh’s transport sector. Inefficient port operations result in congestion in cargo handling and clearance. Weak intermodal connectivity results in prolonged waiting time and occupies space for exchanging cargoes, and higher overall transport costs due to limited availability of transportation modes, which discourages potential economic activities and external trade. Chittagong Port will increase its container-handling capacity in coming years. 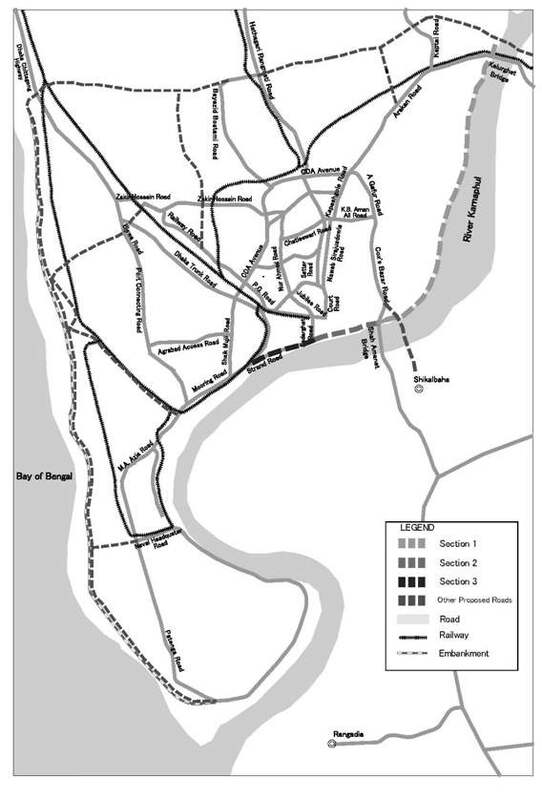 Expansion of the port on the northern bank of Karnaphuli River is constrained by the city; in particular, road and rail traffic bound for the port has to pass through the city of Chittagong (ADB, 2011). Because the Port Access Road has only two lanes, its capacity is believed to be only about 16,000 vehicles per day under normal conditions. In the year 2015, traffic on the road is projected to increase to approximately 14,000 vehicles per day, at which point traffic on the road will be in near capacity (RHD, 2006). Capacity may become short of demand if port-related traffic volumes increase steadily in the future. The Coastal Road can serve as an alternative route to the Port Access Road and therefore will contribute to the achievement of smooth traffic flow between the port and the Dhaka-Chittagong Highway. In the adjacent of the feeder road of the coastal road Chittagong International Airport is situated. If the coastal road is implemented, then the regional traffic from the airport can directly enter to the city outer road and can run through the outer road without creating any hazard in the internal roads and this very important for an international airport to have entry and exit by a road where free flow of traffic is ensured. Besides, it is an prestigious issue for any developing country to face the sick traffic condition in the existing road during before entry or after exit from any International Airport. The part of Chittagong lying along the Bay of Bengal has frequently suffered damages due to storm tides caused by cyclones. The 1991 cyclone, one of the worst, wreaked enormous havoc, causing 138,882 deaths nationwide. In Chittagong, the areas along the Bay of Bengal and the Karnaphuli River were nearly completely submerged, and the area along the Bay of Bengal suffered particularly heavy damages. Historical data show that devastating cyclones that affect over 100,000 people occur once every 40 years or so and strong cyclones affecting over 10,000 people occur about once every 18 years. Owing to climate changes brought about by global warming, cyclones are causing increasingly severe damages. Important production and transport hubs of Chittagong, including the Chittagong and Karnaphuli EPZs, Chittagong Port, and the Chittagong International Airport, are located along the Bay of Bengal. To ensure the City’s continued growth, it is necessary to protect these hubs from cyclones and other natural disasters. Infrastructure improvement for this purpose will benefit not only the society and economy of Chittagong, but also the economy of Bangladesh overall. Patenga Thana is located to the east of the southern (starting) section of the Coastal Road; Population densities in the district are, as shown in Table 2.6‑5, considerably smaller than the average of Chittagong City. They may have considerable potential for development in the future, depending on their road and other infrastructure conditions. In fact, the Master Plan prepared by the CDA in 1995 specifies the area to the west of the Karnaphuli River as one of the three sites with the greatest development potential in the vicinity of Chittagong’s existing built-up zone. However, being situated within a convenient distance from the City center, lack of sufficient road infrastructure act in this zone as a bottleneck in the area. So the progressive development in the area should be patronized by the provision of convenient transport facilities. This is partly attributable to the fact that the area’s proximity to the Bay of Bengal and Karnaphuli River makes it highly prone to flooding. At present the population of Chittagong is expanding quickly, posting growth of as high as 3.8%. Against this backdrop, the “Detailed Area Plan” prepared in June 2008 projects that the population of Chittagong City will reach 3,383,000 in 2015. Along with this steep rise in population, the City’s built-up area is likely to expand outwards in order to spatially accommodate the greatly increased number of people living within its perimeters. Accordingly, the effective utilization of land in the City is required. If the development potentials of Chandgaon and Patenga districts, situated along the Project Road, are realized, the districts can help absorb the extra population that Chittagong is expected to see in the future. The construction of the Project Road is necessary as an essential aspect for the realization of this potential. A simple purposive survey was conducted to achieve the opinion concerning the Coastal Road from seven organizations situated along the Coastal Road. A sample questionnaire, was used for this purpose, has been provided in Appendix 3. Among the seven companies only one (Chittagong Port Authority) are fully aware about the project, but all of others are simply informed about the project, but not entirely known about the details of the project. All of seven companies have recognized the road as a positive initiative for the solution of the existing traffic congestion and as a potential project for the development of the Chittagong city. After showing the lay out plan of the Coastal Road and giving a brief about the project, all respondences specify no specific problem or suggestions in the lay out plan. Only an Assistant Deputy Controller (the respondance of CPA) has opined that the constructed section of outer ring road is still not fully on operation due a problem. So, he suggests about more careful design of the road before construction. 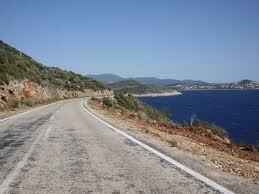 Everyone accepted that the Coastal Road will make beneficial the companies by increased traffic flow frequency. The respondents were requested to give priority rankings to various functions expected to be fulfilled by the Coastal Road (1 for top priority, 2 for second highest, etc.). Table 6.9 gives the scores of the priority rankings indicated by the respondents. According to the table, the top priority is “to divert traffic from existing roads and to alleviate traffic congestion in the city”. The second highest priority is “to prevent disaster”. While the third and fourth are “to enhance tourist attraction” and “to enhance land use and urbanization”. To divert the traffic from existing roads and alleviate traffic congestion from in the city. More than half of the seven respondents specified that there are many spots and areas where road conditions are unsatisfactory. The spots cited were concentrated on roads that link the EPZ with the City center, namely the M.A. Aziz Road, the Sheik Mujib Road and the CDA Avenue. They mentioned necessity of existing road widening as potential countermeasures for dealing with the transportation problem. On the negative side, some respondents expressed concerns about the possible adverse impact of the Project on drainage and environmental conditions. Many respondents mentioned the importance of planting trees and other vegetation along the roadside areas in connection with environmental considerations. In addition, many respondents expressed a need for facilities and systems that ensure greater traffic safety, such as sidewalks to keep pedestrians away from vehicular traffic, separate lanes for motorized and non-motorized vehicles, and crosswalks. There is an attempt of illustration of the possitive impact of the whole outer ring road on Chittagong city if the project is implemented properly in figure .